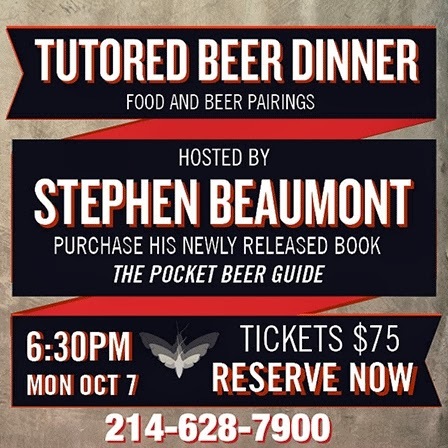 That's right, your favorite beer and food joint is putting on a beer dinner with beer author Stephen Beaumont. You know, they guy that wrote The World Atlas of Beer, easily one of the most beautiful beer books out there. Beaumont will lead the group through course after course of food with beers such as Cuvee Des Trolls, Duchesse De Bourgogne, Ayinger Oktober Fest-Märzen, Dogfish Head Palo Santo Marron and Victory Golden Monkey. Reserve your spot now before they're all taken!